Thirty-eight people have been arrested during raids in Scotland as part of a UK-wide swoop on gangmasters suspected of employing illegal immigrants. The investigation was co-ordinated from Norfolk but involved officers from Grampian Police. 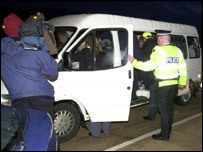 Two van loads of people were stopped in Aberdeen and raids were carried out on four houses in the city. It is understood that the workers involved were being employed in the fish processing industry. Of those arrested, police said there were 28 men and 10 women. The majority were of Eastern European origin. Four men arrested in the north east of Scotland on suspicion of organising workers were taken to Berwick Upon Tweed to be interviewed by officers from Norfolk Constabulary. The remaining people, primarily from the Baltic states, were interviewed by police and Immigration Service staff at Grampian Police Headquarters, in Queen Street. A further 15 people have been dealt with by the Immigration Service. The operation began shortly before 0500 GMT on Thursday when police stopped a minibus carrying workers into Aberdeen to their jobs in the fish processing industry. A second vehicle was stopped some time later as police carried out a dawn raid on the home of a man believed to be one of the gangmaster's assistants. Within a few hours, 38 people had been arrested and a further 15 in the north east had their papers checked. As a result, more than 30 workers failed to turn up at a fish processing plant which is part of the giant Northern Foods group. A spokesman for the company said the workers had been with them for up to two years and added that they had checked the paperwork supplied by their agency. The police investigation, code-named Operation Absent, was part-funded by the Home Office, which wants to combat the influx of illegal immigrants. Norfolk Police confirmed that in addition to the 38 arrests in Scotland, two people were arrested in King's Lynn. Grampian Police said that two of the arrests they were as a result of a house raid in Fraserburgh, which took place between 0600 and 0700 GMT. Detective Superintendent Jim Stephen said: "This is by far the largest operation of this nature which Grampian Police has been involved in. "An operation of this scale shows the benefits of working jointly across the country. " A spokesman for Norfolk Police added: "The operation was to tackle the exploitation and influx of illegal immigrants into the UK." The Transport and General Workers' Union has been pressing for a licensing and registration scheme to prevent the exploitation of immigrants. Deputy general secretary Jack Dromey welcomed Thursday's police action and said: "The existing legal framework means that the police are left chasing the tails of rogue operators, reliant on informers from vulnerable communities. "New legislation is necessary along with a nationwide crackdown on those gangmasters who practice modern day slavery." A Scottish MP, Labour's Jim Sheridan, West Renfrewshire, introduced a private members' bill in the Commons on 7 January. It gained a second reading unopposed on 27 February and will shortly begin its committee stage. The bill is expected to be brought to the House of Lords in May. "Within a matter of a few hours police have made almost 40 arrests"